Since September 2014, our school has been running a systematic school readiness program in the Czech and English language. We consider it our priority to get the children ready for an easy transfer to an elementary school. The school readiness training in the English language is conducted by our native-speaker teachers. In the Czech language, it is taught by Lenka Prixová from the Elementary School Petřiny - Jih in Prague. The Blue and Green classes prepare children systematically for school readiness. Training of fine motor skills and graphic-motor skills. Orientation in time and space. In order to achieve development of all the above mentioned skills, children work with special worksheets in every day lessons. For instance, graphic-motor skills worksheets help children develop skills necessary for learning how to write, and with help of special rubber penholders they also learn how to hold their pen properly. As part of the pre-reading preparation, children get familiar with books and their proper handling. They learn how and where books are created, who is an author and who is an illustrator. Children also create their own stories, which they enthusiastically tell to others, and they love when a parent comes to their class and reads them a story. This program is for children Czech native speakers. 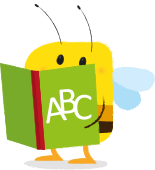 The Green Class curriculum includes Jolly Phonics. In this reading program, children learn with help of pictures to recognize not only letters but also whole words. Initially, they learn to recognize sounds of individual letters and to match the sound with the appropriate letter. The next step is putting the letters in the alphabetical order. Concurrently, they learn with help of short stories to recognize visual appearance of whole words and to put the words in to short sentences such as "I like apple". On the first floor of our pre-school, there is a special notice board related to school readiness preparation and Jolly Phonics, where parents can follow our work with children.